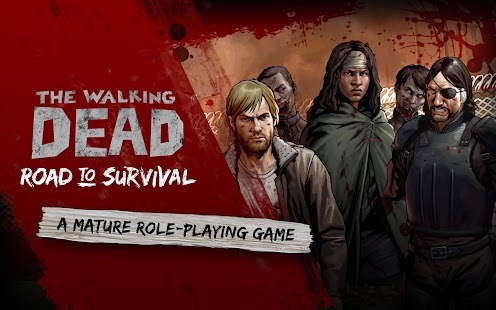 Walking Dead: Road to Survival - A thrilling, mature adventure constantly toeing the line between life and the undead, The Walking Dead: Road to Survival is the definitive Walking Dead role-playing game experience. Based on an all-new story from award-winning Walking Dead writer Jay Bonansinga, the dark aesthetic of this game reflects the uncompromising decisions you will need to make as you fight for survival. Are you ready to take over Woodbury and put an end to The Governor’s tyranny? Recruit survivors and lead your team into the perceived safe haven of Woodbury, fighting and scavenging to join forces with the town. Little do you know a madman will rise to governing power, pitting people against each other in ways that make you question humanity. A small group of rebels will ignite war to break free from the tyranny - will you be brave enough to fight with them? Brought to you by Robert Kirkman, creator of The Walking Dead comic. • UPGRADE YOUR TEAM - Customize your Survivors to increase their power, weapons and skills. RPG progression makes your Survivors become more powerful as they cut down more walkers. • YOUR DECISIONS HAVE MEANING - The choices you make while completing missions can change outcomes in the game. Write your own Survivor story in this dynamic and compelling RPG. • COLLECT ICONIC CHARACTERS - Recruit famous survivors from The Walking Dead comics to join your team, including Michonne, Rick, Andrea, and Glenn. Join Lee and Clementine from Telltale’s hit The Walking Dead adventure games in a brand new journey. • BUILD THE ULTIMATE BASE – Building an airtight city is the only way to keep vicious walkers out. Upgrade your Town Hall to expand your city into the wasteland, craft items at the Workshop, and take in Survivors by building houses. • FIGHT WALKERS AND SURVIVORS – Fighting skillfully is the only way to survive the walker hordes. Obliterate opponents with special melee and ranged attacks using an arsenal of deadly weapons, including Michonne’s Katana. • EXPLOIT STRENGTHS AND WEAKNESSES - Use strategies to score powerful hits, but watch out for cunning enemies – Each character has their own strengths and weaknesses in this brutal RPG. • JOIN ONLINE FACTIONS - Don't be left behind! Band together with friends and allies to create a battle strategy, pool resources and survive in this harsh world. • RAID ENEMIES IN PVP – Road to Survival’s online PvP mode challenges you to raid enemy factions for resources. Explore a wide-open world filled with potential enemies, and use cunning strategy to make your city come out on top. • LIVE IN-GAME EVENTS - Play to obtain valuable resources and new, exclusive Survivors. Download The Walking Dead: Road to Survival – Join the online war against the walkers today! Please Note: Walking Dead: Road to Survival is free to play, but it contains items that can be purchased for real money.